In a large bowl, combine together the dry ingredients. Set it aside to whisk the egg whites. Whisk the egg whites until frothy in a medium-sized bowl. 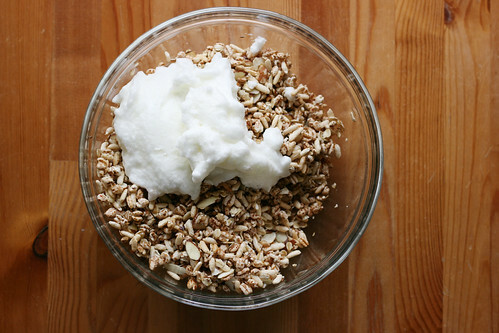 Stir the maple syrup or other sweetener, butter or olive oil, honey, and vanilla into the granola mixture until combined. Then gently stir in the egg whites until the mixture is evenly coated. 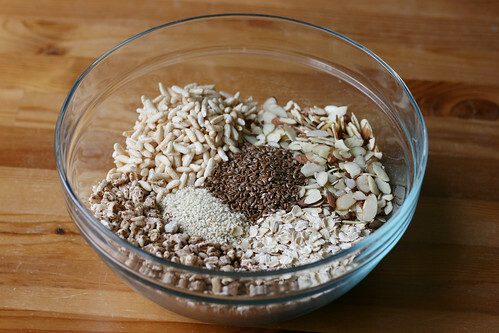 I try to work with the granola quickly once I start adding the wet ingredients to prevent it from getting soggy. Transfer the mixture to a cookie sheet lined with parchment paper and spread it out, concentrating more granola mixture near the edges, where it cooks more quickly. 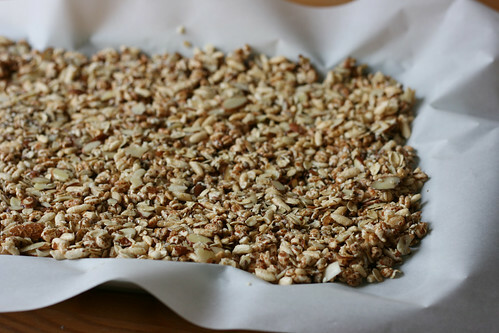 Bake the granola, stirring every 10 minutes, until it is evenly browned and looks dry, about 40 minutes. It might not be crunchy right out of the oven but it should become crunchy as it cools. Cool completely. Once it is cooled, break up any large clusters into sizes of your choosing. 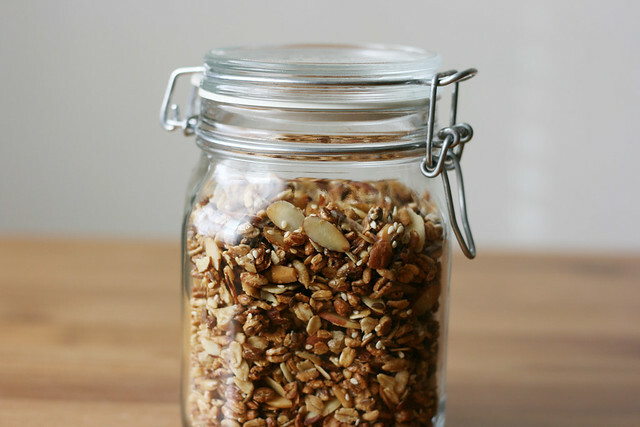 Store the granola into an airtight container. It keeps at room temperature for about two weeks. My favorite way to eat it is over plain yogurt sweetened with a little bit of honey and topped with fresh fruit. Check the nutritional label if you consume store-bought yogurt. Yogurt has a fairly large amount of sodium. 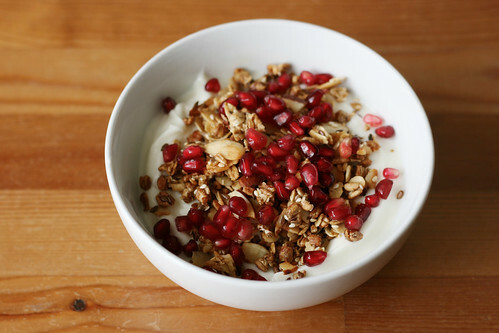 Choosing original style rather than low-fat yogurt helps. The puffed whole grains listed on the ingredient list are the following, in order: hard red wheat, brown rice, barley, triticale, rye, buckwheat. I could only find from those the puffed wheat and puffed rice at Whole Foods (my regular grocery store does not carry puffed grains). They’re also available online at a few places. Plum Market and iHerb have reasonable prices (taking the cost of shipping into consideration). Mine are all single ingredient, no salt added cereals. Another ingredient missing from my recipe are soy flakes, of which there are a lot in the cereal on which I modeled this recipe. You might want to add a cup of them if you have them. Stirring in the egg whites will give you crispy clusters. Use just one egg white if you have jumbo eggs. If you want to skip the egg whites altogether, stir more often while it’s baking to ensure even browning. Choose the olive oil over the butter, skip the egg whites, and replace the honey with another sweetener. 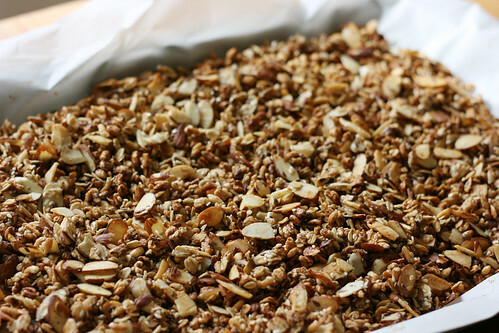 Stir more often while the granola is baking to ensure even browning. freakin yum! player hatin degree!